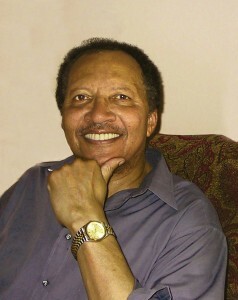 Photo of award-winning author Walter Dean Myers from his website: http://walterdeanmyers.net. I saw his magic with kids first-hand at the African American Children’s Book Fair in Philadelphia. Children flocked to greet the legend and get their books signed. Brother Walter wore his National Ambassador for Young People’s Literature medal around his neck, not to show them who he was, but to show them who they could be. As each young person talked to him, Brother Walter seemed to see no one else. The child in front of him was who mattered. And each one knew it. Faces shone with grins. They leaned in to hear every word and left clutching their signed book, a treasure. Brother Walter was a giant, a tall man with a super-sized heart. A man with huge talent who through his words, through his caring, through his commitment, made people of all ages feel like they could soar. Today, we celebrate the incredible life and contributions of Walter Dean Myers, a literary giant who blessed the world with more than 100 books for children and young adults. Check out his complete bibliography here. We’re honored to feature essays from two of Walter’s friends, author and publisher, Wade Hudson and author Linda Trice. Their posts immediately follow this one. Let’s keep Brother Walter’s family in our prayers and honor his legacy by sharing his beautiful books, some of which were illustrated by his son Christopher. Please post your memories and reflections about Walter Dean Myers in the comments. Thank you. Thank you for putting all of these posts in one place. I never spoke to this man and was intimidated by his body of work and his very greatness, I smile to think of him as the man who said “We Need Diverse Books…” before there was a #hastag. And never stopped saying it, either.